The Fynbos Forum is an affiliation of natural scientists, researchers, planners, managers, landowners and stakeholders. The forum meets annually to discuss the collaborative production of knowledge that underpins regional conservation efforts in the fynbos biome, South Africa. As a transdisciplinary regional learning network, the Fynbos Forum supports discussions on management issues and research results. The annual meeting formulates priorities for future research and conservation management actions required to ensure the conservation and sustainability of fynbos ecosystems. In order to achieve this goal, Fynbos Forum members undertake to assess biological resources, ensure institutional capacity and consider socio-economic issues. The Fynbos Forum annual meeting is usually held in the first week of August. The venue of the 41st Fynbos Forum is Elim, Western Cape. The Fynbos Forum: Its Impacts and History by Caroline Gelderblom & Julia Wood. Published by: The Fynbos Forum, Cape Town. 226 pages, 2018. ISBN Number: 978-0-620-80362-5. With grateful thanks for sponsorship from the Table Mountain Fund, WWF. 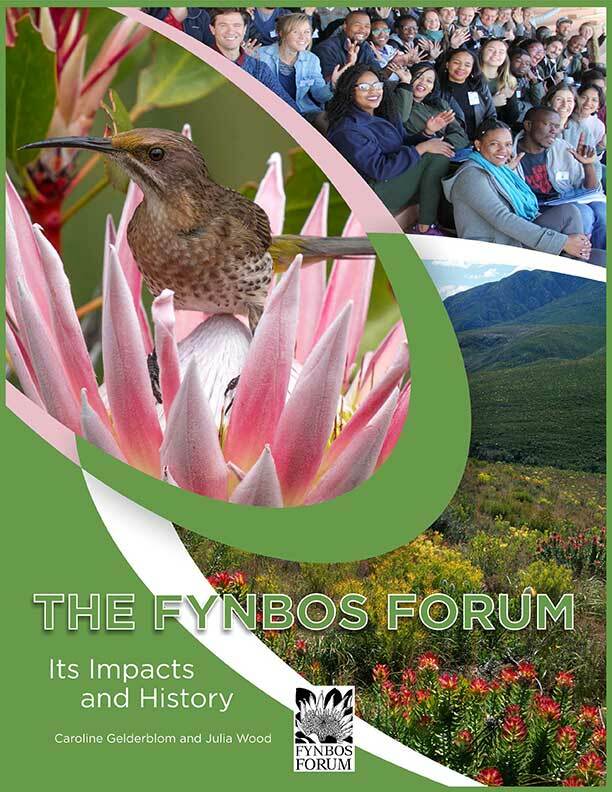 On 1 August, 2018, this book on the 40 year history of the Fynbos Forum was launched at the 40th Fynbos Forum, Rawsonville. The book showcases the personalities, research and fynbos management expertise that underpins the success of the Fynbos Forum.